In yet another sign of the looming apocalypse, Encyclopedia Britannica has announced that it will no longer print paper copies of its annual reference books. After 250 years of filling homes with handsomely bound cinderblocks, the reference giant is going digital. The news comes as a great disappointment to anyone in need of a doorstop or impromptu booster seat. It is a bummer, too, for those of a certain age who can remember when no household that considered itself even remotely civilized would lack a collection of Encyclopedia Britannicas or World Books or Funk and Wagnalls in its living room. So what does the company’s demise mean for lawyers? * The game is always changing. Encyclopedia Britannica was ahead of its time. It was an original world-wide content provider and a pioneer of the practice of “continual revision,” which makes a one-time buyer a customer for life. And yet, after seeing its annual sales bottom out, it had to come to grips with its own obsolescence. * Information delivery is moving at light-speed. Much of what lawyers sell is information. How that product is delivered in the future will depend on technological innovation and consumer demand. * Customers prefer free to expensive. The printed encyclopedia industry was done in by Wikipedia, which is free, instantly available and requires no shelf space. Some legal services can be provided at little cost. Might these be used as loss leaders to attract more lucrative work? * Strive for continuing relationships with clients. Long before Microsoft and Apple began raking in gazillions with perpetual upgrades and “new, improved” gadgets, Encyclopedia Britannica saw the wisdom of hooking customers with a base product and then reeling them in with annual updates. Similarly, successful lawyers will search for opportunities to create ongoing associations with their clients. 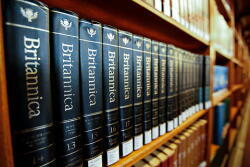 So farewell Britannica. Although personally I will miss those way-cool transparent overlays, where you could construct the solar system planet by planet, or take a peek inside a frog.